The canvas painting on the wall called to Tara as she walked back into the kitchen, this time her arms filled with rock-climbing gear. I am very excited to read this book. 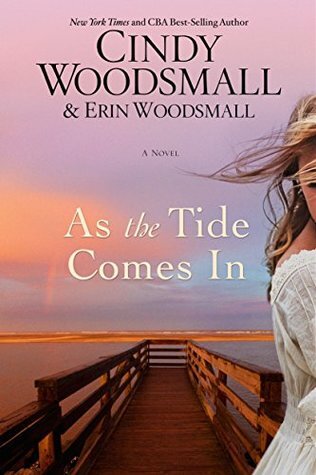 I have enjoyed the few Cindy Woodsmall novels that I have read. And, I adored The Gift of Christmas Past, another novel she co-wrote with Erin. As the Tide Comes In looks to be quite the emotional roller-coaster. If it’s anything like The Gift of Christmas Past, I know this will be a wonderful read. I can’t wait!!! NOW IT IS YOUR TURN! GRAB THE BOOK YOU ARE CURRENTLY READING, OPEN TO CHAPTER ONE, AND POST THE FIRST SENTENCE (OR SECOND SENTENCE) IN THE COMMENTS BELOW. THEN HEAD ON OVER TO HOARDING BOOKS TO SEE ALL OF THE FLF PAGES THIS WEEK (JUST CLICK ON THE FLF BUTTON BELOW). Thank you so much for sharing! Have a happy Friday, and a great weekend. IN THE MIDDLE OF THE MESS by Shelia Walsh: “I looked at my face in the dressing room mirror—pale and tired. Thank you for sharing Vickie! I have that book scheduled for later this summer. Here’s the first line from the next book in my TBR pile — A Rebel Heart by Beth White. “Selah could hear the horses thundering closer, oncoming hell and destruction.” Happy Friday! Thank you for sharing. I will eventually get to A Rebel Heart…one day…when I have a little more free time in my schedule. Have a great weekend! Thank you for sharing, Kay! The book I’m featuring on my blog is “The Country House Courtship” by Linore Rose Burkard. Since I’m still reading this novel, I will share the first line in Chapter Seventeen here. “Mrs. Royleforst finally made her public entrance among the guests after taking breakfast in her room and spending much of the day abed.” Wishing you a wonderful weekend! Thank you, Anneliese, for sharing! I hope you have a great weekend. This sounds like quite the engaging story! Over on my blog, I’m sharing the first line from Karen Whitemeyer’s More Than Meets the Eye. There is also a giveaway running on the Author Interview post with Karen on my blog. Please stop by and enter to win an author autographed print copy! Thanks for sharing Trisha! I hope you are able to have a relaxing weekend. HUGS! Thank you for sharing! I hope you have an excellent weekend. Happy Friday!😊 What a great cover! If Lucy Maxwell had learned one thing, it was that when life appeared to be going smoothly, it was time to listen closely for the other boot to drop! I love that line! Thank you for sharing. I hope you have an excellent weekend, too! I was asked to review this one. I can’t wait for my copy to arrive! I’m sharing about “Just Let Go” by Courtney Walsh on my blog today, but I have “The Hawaiian Discovery” by Wanda Brunstetter and Jean Brunstetter waiting for me to read next. Ellen Lambright finished sweeping the kitchen floor and paused from her work to brew a cup of tea. Can’t wait to get to Just Let Go. I have one book to read first and then I am on it! Thanks for sharing your first line from your next book with me. I hope you have a great weekend. I can’t wait to read this! Thanks for sharing! Interesting first line…I want to know more! I don’t think I have read anything by this author before, but it looks like a great book. Happy Friday and happy reading! I love the cover! I’ve read a few Cindy Woodsmall books too but not this one yet. The book I’m sharing this week is Jane Eyre by Charlotte Bronte but I’ll share here the book I’m currently reading which is Blind Spot by Dani Pettrey: “Luke crouched behind an orange shipping container, dreading to think what it held. Have a great weekend and happy reading! Guilty. That’s the only possible verdict. You see, love stories never worked for her. She never got the guy. I’m almost done with The Love Letter. Oh my!!! I have no words…it’s so good! Right?! I’m working on my review right now!